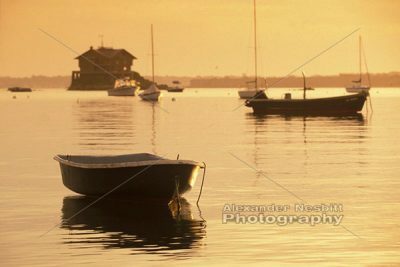 Dinghies float on a mooring with Clingstone, ‘the house on the rock’, in the background during a golden sunrise near Jamestown, RI. 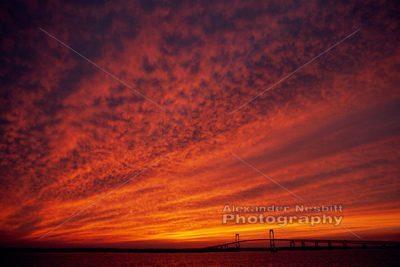 Wide angle view of the sunset as it paints low clouds over the Narragansett bay and Newport bridge. 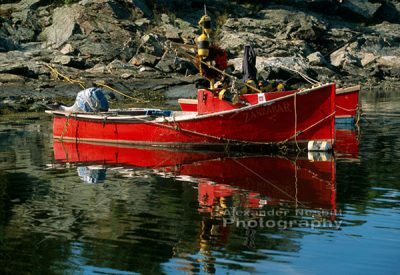 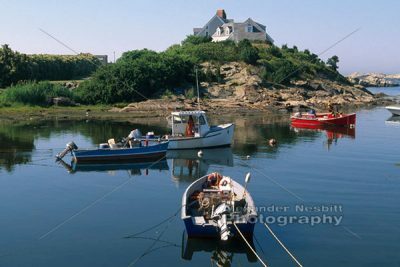 Lobster boats rest quietly in Gooseneck Cove near Green Bridge on the Ocean Drive. 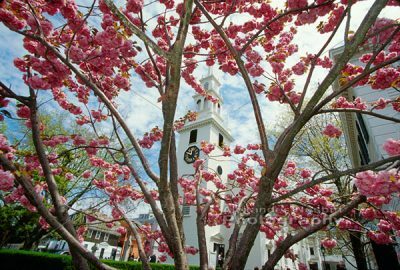 Springtime view of Trinity Church in Newport through a blooming cherry blossom tree. 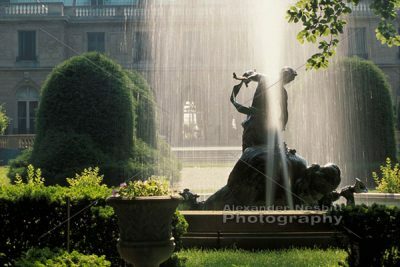 A gushing water fountain at the Bellevue Avenue entrance to the Newport mansion ‘Miramar’, a privately owned home. 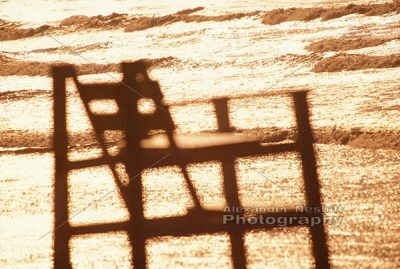 Lifeguard chair is silhouetted in the glare of sunlight off the waves at Easton’s or “First Beach”. 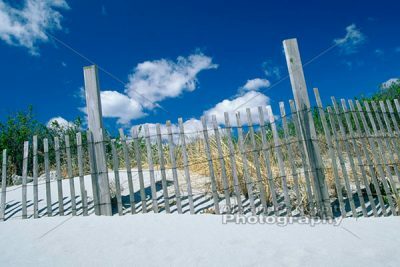 Dune fences along Newport’s Gooseberry Beach. 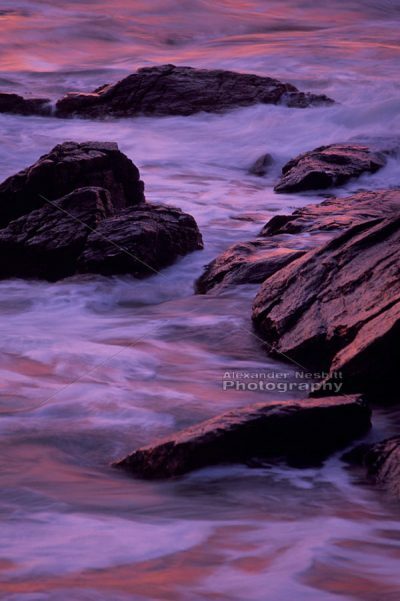 Sunrise reflects on the sea and wet, rocky shore at Sachuest Point National Wildlife Refuge. 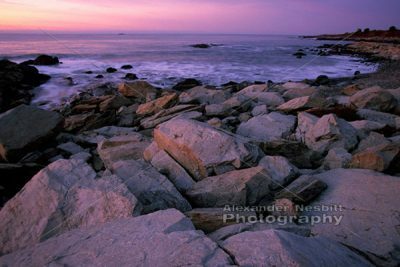 A pink sunrise reflects on the rocky shore of Sachuest Point National Wildlife Refuge. 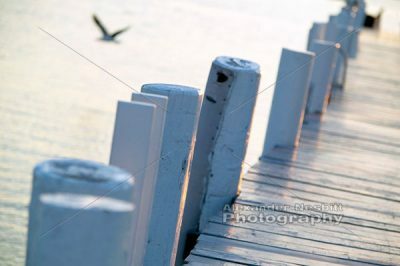 A seagull flies past pilings of Bannister’s Wharf. 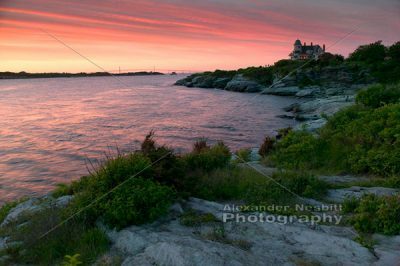 Panoramic night time view of Newport’s waterfront taken from Goat Island. 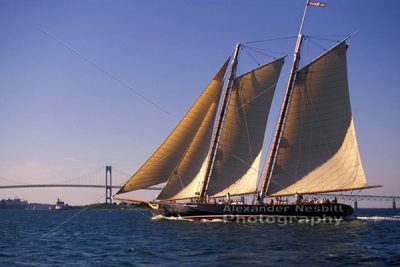 A replica of The Schooner America sails past Newport Bridge in Narragansett Bay. 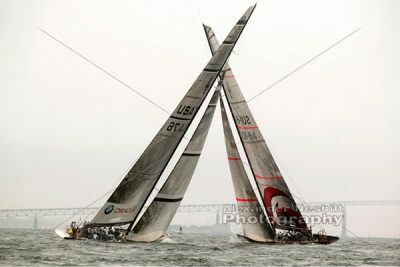 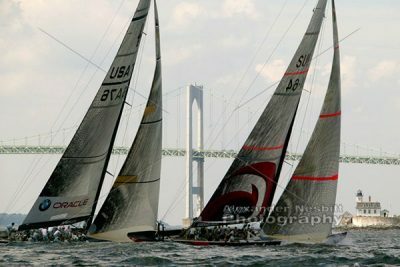 America’s Cup boat rigs cross, as a tacking duel unfolds on the upwind leg during a race for the 2004 UBS trophy. 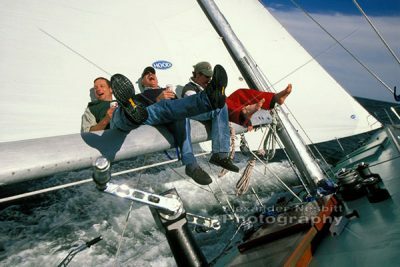 12 Meter crew whoops it up while sailing aboard Nefertiti in Newport Harbor. 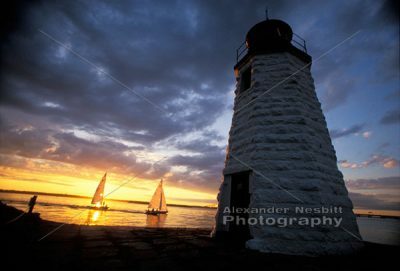 A Shields sailboat passes in front of the setting sun near the Newport Harbor Light on Goat Island in Narragansett Bay. 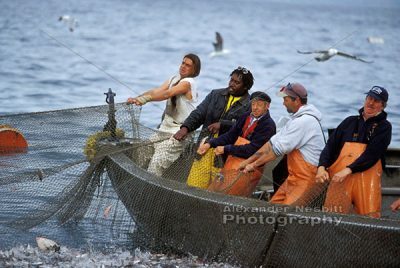 A trap fishing crew from the Aquidneck Lobster Company work together to haul the trap net. 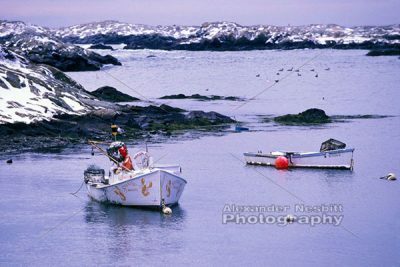 A dusting of snow covers the area while rustic lobstering skiffs hang at their moorings in the inlet near Green Bridge on the Ocean Drive. 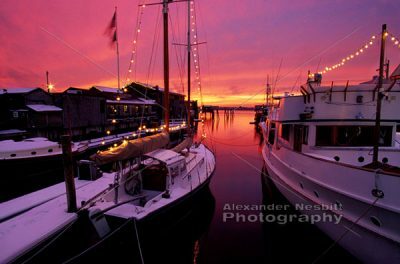 A magenta winter sunset over Narragansett Bay in the snowy holiday season. 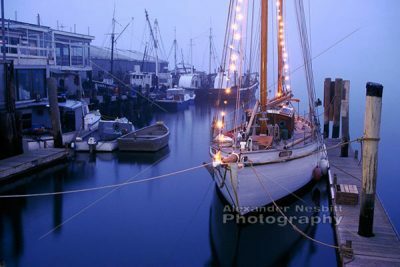 The former flagship of Cape Town, the yacht ‘Halloween’ lies at her slip at Bowen’s landing on a foggy winter evening. 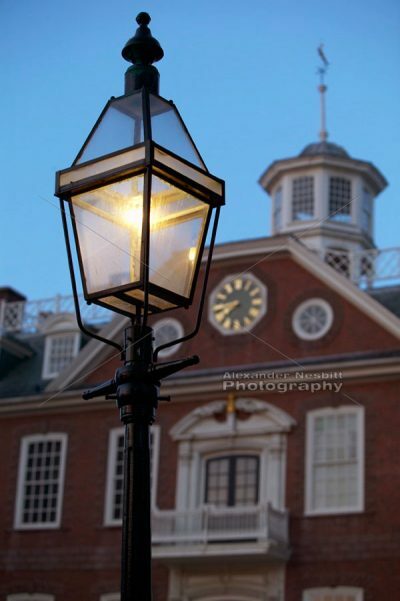 A gas lamp is in the foreground of the Newport Old Colony House, on Washington Square. 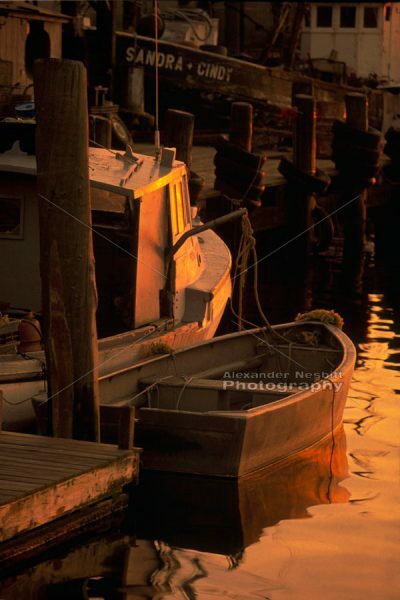 Lobster boats and a dory float in calm waters at Bowen’s Landing and the Aquidneck Lobster Co. with warm sunset light.